Serving Collectors and Investors for Over 50 Years. Deal of the Day. 1986 – 2018 American Silver Eagle Proof – Complete Date Set. 1986 – 2018 American Silver Eagle Proof – Complete Date Set Complete US Mint Packaging including Certificate of Authenticity This Silver Eagle Proof Set includes a complete 32-coin date run of the Proof Silver Eagles from 1986 to 2018. NOTE: The US Mint did not produce a 2009 Silver Eagle Proof. American Eagle Silver Proof Coins are collector versions of the official United States bullion coins and are only available in the one ounce size. American Eagle Silver Proof Coins from 1986 to 1992 were minted at the United States Mint at San Francisco bearing the “S” mint mark, 1993 to 2000 were minted at the United States Mint at Philadelphia bearing the “P” mint mark and 2001 to date minted at the United States Mint at West Point bearing the “W” mintmark. Coin Designs Obverse: Adolph A. Weinman’s full-length figure of Liberty in stride, enveloped in folds of the flag, with her right hand extended and branches of laurel and oak in her left. Reverse: Heraldic eagle with shield, an olive branch in the right talon and arrows in the left. Coin Artists Obverse: Adolph A. Weinman (1870 – 1952) Reverse: John Mercanti, Sculptor-Engraver, United States Mint Our “vintage” US Mint products have been previously owned. They are hand-inspected to ensure they are complete and include all original US Mint packaging. Vintage coins may show some effects of aging and packaging may have some minimal wear and tear. This listing uses “Reference Images” The “Reference Images” used in this listing Description were created by Liberty Coin for reference only to depict the quality of the item you will receive. You will NOT receive the exact item that was photographed to create the Reference Images. However, the actual item you will receive is guaranteed to be similar to that shown and exactly as described. Philadelphia, San Francisco, West Point. Adolph Weinman (obverse), John M. Original Government Packaging & Certificate of Authenticity. UPS 2 Day Air with Signature Confirmation. If you need to change the Address you should cancel your order and place a new order using the correct address. Bullion coins, bars and rounds are mass-produced and are not manufactured to the same quality standards as collector coins. Listed prices for bullion products are firm and not negotiable. Prices will change with movements in the spot price of the underlying metal while precious metals markets are open. Pre-Owned Vintage US Mint Products. Except for current year products, nearly all of our US Mint products have been previously owned. Unless otherwise disclosed, all of our US Mint products come with their complete original packaging. We inspect all pre-owned US Mint products prior to offering them for sale. We only sell sets that have passed our inspection; the coins are typically free of excessive hazing, spotting, or distracting toning. While the items are typically in very good condition for their age, these vintage products are not new. Use of Stock Images. We typically have multiple quantities available of many of our most popular products. As a result we often use “Stock Images” to represent the actual product. When a “Stock Image” is used to merchandise a product, that use will be disclosed as follows. The’Stock Images’ used in this Description are an indicator of the quality of the item you will receive. The actual item you will receive is guaranteed to be as described and depicted. “Random Dates” Product Listings. When purchasing “Random Dates” products you can expect to receive dates and types of our choice, depending upon current stock on hand. Due to high volume it is impractical for us to select specific dates upon request. Liberty Coin attempts to display product images shown on the site as accurately as possible. However, we cannot guarantee that the color you see matches the product color, as the display of the color depends, in part, upon the monitor you are using. Prices and availability of products and services are subject to change without notice. Errors will be corrected where discovered, and Liberty Coin, LLC reserves the right to revoke any stated offer and to correct any errors, inaccuracies or omissions including after an order has been submitted and whether or not the order has been confirmed. Since 1965, Liberty Coin has offered an ever-expanding line of precious metal bullion, collectible coins and US Mint products. Whether you are an investor seeking asset diversification through precious metals, an experienced collector searching for a key date coin, or simply trying to find a vintage Proof Set as a gift, Liberty Coin’s extensive inventory is available to meet your needs. To contact Liberty Coin. Sign up to receive special insider notifications of deals, promotions, and new items! Powered by Solid Commerce The All-in-One Listing, Inventory & Order Management Solution. The item “32-pc. 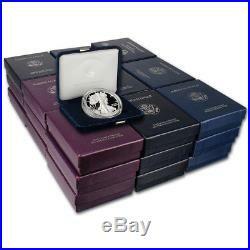 1986 2018 American Silver Eagle Proof Complete Date Set” is in sale since Saturday, April 21, 2018. This item is in the category “Coins & Paper Money\Bullion\Silver\Coins”. The seller is “liberty.coin” and is located in Huntington Beach, California. This item can be shipped to United States, Canada, United Kingdom, Denmark, Romania, Czech republic, Finland, Hungary, Malta, Australia, Greece, Portugal, Cyprus, Japan, Sweden, Indonesia, Belgium, France, Hong Kong, Ireland, Netherlands, Poland, Spain, Germany, Austria, Singapore, Switzerland, Norway, Saudi arabia, United arab emirates, Qatar, Kuwait, Bahrain, Malaysia, Brazil, Colombia.